Now that the heat of the election season has passed, it is possible to examine the heat itself. The election's aftermath was a grand spectacle. Some convulsed in desperation and despair. Others surrendered to frenzied, twitter-fueled fits of rapture. In the midst of all this noise, a pattern arose. In simplest terms: there is a 1:1 correspondence between what a person thought was America's biggest problem before the election, and what that same person now believes was the root cause of the election's result. Did you think that America's most serious problem is that the Federal government is not built on the Scandinavian mold? Then was obviously if Sanders had been the nominee none of this would have happened! Were you more annoyed by Sanders attacks on the DNC and the integrity of its favorite candidate than anything else last season? Then obviously it was these very attacks which kept millennials out of the voting booth! 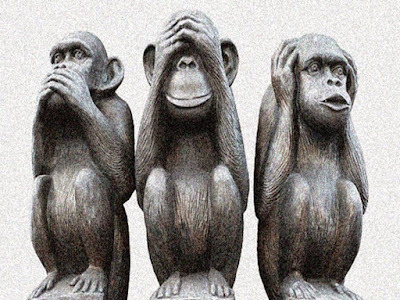 Is America's big problem racism? Then it was obviously uber-racism that brought Trump his victory! Long critic of American trade practices? Then it was Trump's promises to the working class workers that brought him success. Is political corruption and the Beltway-insider game the thing that makes your blood boil? The obviously it was the nomination of a crook that made the GOP sweep secure. NeverTrumper? Then the real problem was liberal over-reach, and this kind of thing was going to happen no matter what. I am not immune from this. Ask me what I thought about the Vox kids before election day. Here is the interesting thing in all this: in November, 2016, America witnessed a potentially era-defining political transition. It was a huge shift in the distribution of power. It was also a shift that almost no one saw coming. Yet somehow, every single person's reaction to the election (and I really mean every. single. one.) is to double down on whatever narrative and guiding beliefs they were committed to before it all went down, despite the inability of said narratives and beliefs to prepare them for the event. This election's unexpected result is not opening minds. It is slamming them shut. This makes sense in it's own way. Power has been disrupted; those who can obtain a share of it now get to determine the narrative for the next few years or so. We are hard wired to avoid self-doubt in times of anger. Victory goes not to the strong, nor to the brave, nor to the carefully reasoned, but to the assiduously self assured. Power does not exist for the sake of reason; reason exists for the sake of power. Now is the time for the ambitious to seize it. I suspect it will be many years before Americans will be able to look at the election of 2016 with a more open mind than they had going into it. A supposed bust of Alcibiades. The key to making the ascent is a slow and steady climb. If you go forward too fast your snow tires will find no grip. But you must move forward. If you take your foot off the gas pedal, even for the smallest moment, you invite death (or an expensive insurance claim) to your door. When the road is that slick, the car cannot stay in place. In that day not even your parking breaks will be of any use to you. Either you press forward, or you find yourself in a terrifying, uncontrollable slide back down the hill. This moment—the moment where you are offered an unfeeling binary between surging forward and crashing backward—is the Alcibiades point. “If virtuous officials are employed, the people will love their own relatives, but if wicked officials are employed, the people will love the statutes. To agree with, and to respond to, others is what the virtuous do ; to differ from, and to spy upon, others is what the wicked do. If the virtuous are placed in positions of evidence, transgressions will remain hidden ; but if the wicked are employed, crimes will be punished. Bottom to top, the state of Qin was a society ordered for war. “Optimize everything” is a 21st century phrase the Qin would understand. Every man was plugged into an elaborate 13 rank social hierarchy, his position determined entirely by his martial accomplishments. The old aristocracy was seen as superfluous, and so were suppressed; independent artisans, ritual masters and musicians, philosophical schools, and wealthy merchant clans won no wars, and so were rooted out and eliminated. Those who farmed more and fought more prospered. Those who failed to do either were punished. Roads, coins, letters, measures, and laws were standardized in the name of efficiency. The shape and size of houses and farming plots were dictated by the state to maximize crop production and taxation. A mammoth bureaucracy—the largest of the pre-modern era—was created to impose all of this on the wider population. Families were organized into collective responsibility groups to enforce these measures; failure to report the failings of your neighbors meant everyone in the group would be punished for them. The Qin built their empire on a nightmare. But it was a nightmare that worked. The Qin fought war after war after war—more wars, in fact, than any other Warring State—and incorporated what they conquered into their system. They went from strength to strength. After a century of constant conflict there was no one left to oppose them. The Qin rode their nightmare straight to universal empire. For the first time in history, all of inner China was in the control of one man. The Qin imagined they had established a dynasty that would last through the millennia. It was a vain vision. It had taken 150 years for the House of Qin to conquer China. They would rule it for 15. So why did the Qin dynasty fail? The most insightful discussion of this catastrophe is also the earliest. Writing only a couple of decades after the Qin collapse, the early Han scholar Jia Yi argued: "One who conquers the lands of others places priority on deceit and force, but one who brings peace and stability honors obedience to authority. This means that seizing, and guarding what you have seized, do not use the same techniques. Qin separated from the Warring States period and became ruler of the whole world, but it did not change its ways or alter its government. Thus, there was no difference in the means by which they conquered and the means by which they tried to hold it." For all the ambition of the Qin reforms, with their vision of a new world where measures, laws, and truths flowed from a single source, the implementers of these reforms carried the basic institutions and practices of the Warring States unchanged into the empire. The direct administration of peasant households who were mobilized for military service continued as the organizing principle of the state, with a large servile labor pool formed from those who violated any of the numerous laws. No longer necessary for inter-state warfare, this giant machine for extracting service had become a tool in search of a use. The Qin had shot past the Alcibiades point. They realized too late that they had no way to keep the tops spinning. It is not clear if Alcibiades actually believed the argument Thucydides put into his mouth. It is an unusually self-serving one. Given the outcome of the Sicilian Expedition, it is easy to dismiss it. I would not be so quick to do so. 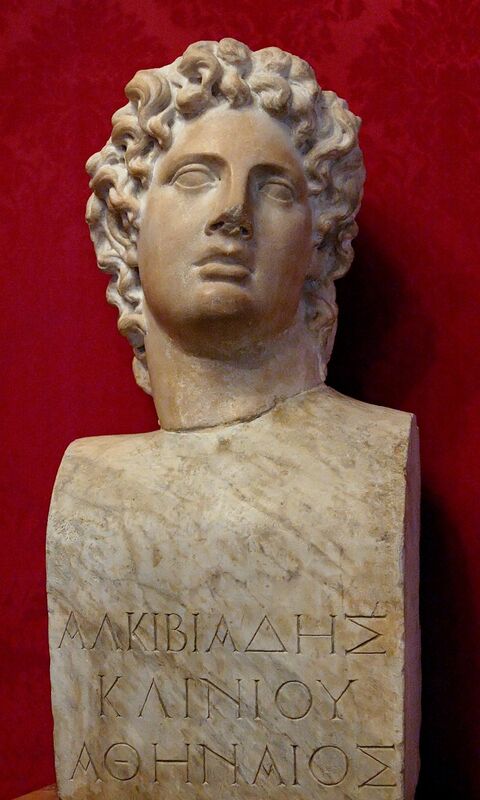 Alcibiades needed something convincing to inspire his fellow citizens to war, and at this point in the contest the Athenians had fallen deep into the cold rhetoric of realpolitik. Alcibiades made a compelling point—the Athenians were a people who could not sit still. Her empire was built on fear of her power and strength of her word. What could maintain that fear in times of plenty and peace? “Take one’s character and institutions for better and for worse,” he advised, “and to live up to them as closely as one can” (6.18). Athens had reached its Alcibiades point. The Athenians would now either climb the hill or come crashing down it. Book of Lord Shang, Book 5, Par 1. Translated in J.J.Duyvendak, The Book of Lord Shang, (London: Arthur Probsthain, 1928), 117. Mark Edward Lewis, Early Chinese Empires: Qin and Han (Cambridge, MA: Harvard University Press, 2007), 71. The most famous episode in Thucydides’ History is found in its fifth book. Known as the “Melian Dialogue,” it is one of the best known statements of what we moderns call realpolitick. I read this passage long before I read any other part of Thucydides’History. It was one of the opening chapters in the ‘standard-readings-in-IR-theory’ primer assigned in my very first POSC class. It’s stature in that class is hardly unique. This episode has been picked apart, commented on, and excerpted more than any other in the book. In this roundtable it has already prompted three separate discussions. I will add yet one more here. But I suggest a different approach: to understand the themes and purpose of this dialogue, it is best to rewind. ….Thus as far as the Gods are concerned, we have no fear…. A recurring theme of Thucydides work is the contrast between the Spartans and the Athenians. In Book V Athens launches an attack on Melos, by blood and kinship a natural friend of Sparta. The Athenians wage devastation on the Melians knowing it is not just to do so. The same book sees the Spartans waging wars—this time on Argos, by regime and belief a natural friend of Athens. Five times do Spartan armies march to the border of Argive lands. Of the five invasions, three are ended before they begin “because the sacrifices were unfavorable.” (5.54, 5.55,.5.115). One of the two times Spartans actually step on Argive soil, Spartan leadership decides to defer bloodshed for the sake of just arbitration (5.83). Only once does the attack proceed as planned, and that only when the Spartans are threatened with the specter of a second pair of long walls extending from a powerful enemy capital to the sea. The contrast between Sparta and Athens is found in the fifth book of Thucydides’ history, but it is not obvious. To see it you must screw your eyes up and tilt your head a little bit. …. We see that you are come to be judges in your own cause…. Melos was not the first polis to suffer the fury of the strong. Nine years before her destruction other polis trembled in fear before the judgement of a hegemon. In Athens the polis in question was Mytilene. Her fate to be decided by a jury of the Demos, a trial not entirely different in form the sort of criminal cases Socrates’ Apology would make famous. Mytilene had rebelled. Yet before the Athenian hoplites could sack its capital, Mytilene’s ‘Many’ had removed her ‘Few,’ and surrendered their city to democrats on their doorstep. Now they waited in judgement. A second trial would occur soon after—soon enough after that Thucydides places the stories one right after the other. Here the Spartans played the role of judge and jury, and here again the trappings of a formal trial were adopted. Standing accused were the remnants of Plataea. For four terrible years they had resisted a Theban siege. With Spartan help the Thebans were close to breaking through. But here again surrender was declared well before sacking could begin. The Plataeans turned themselves over to the Spartans and waited to see what judgement they might receive. The Plataeans and the Mytilenians both heard a case arguing for their death, as well as one arguing for their continued survival. In the Mytilenian case, both the defendant and the prosecution were represented by Athenians. In the case of Plataea, the Plataeans were forced to speak in their own defense, with the Thebans arguing for their death. The parallel is clear. It to the arguments we turn to find the contrast between the two hegemonic powers. ….What is this but to make greater enemies than you have already, and to force others to become so who would otherwise have never thought of it? The Athenians were once a people of honor. “For glory then and honor now” was the rallying cry Pericles raised to lead his people to war (2.64.6). The Athenians began this entire drama chasing it. No longer. Athenian honor died long before the war’s close. Athenian honor could not survive the plague. Then the beastly truth was revealed: honor meant nothing but scarred skin and blistered visage. Nobility brought no recompense but rotting flesh. Eat now, drink now, be merry now, for tomorrow men will die! And die, and, die, and die. Justice, integrity, honor—mere words. Where could those words be found? Buried deep in burning heaps of flesh! Abandoned in lonely, forgotten corners where none would see them croak away! Beneath blood, phlegm, pustule, and vomit! What has honor to do with Athens? What is more, they knew it. Thucydides relates the speech of two men in the debate over Mytilene, one Cleon, son of Cleanetus, the ‘most violent man in Athens.’ The other Diodotus, son of Eucrates, a more measured sort who does not appear elsewhere in this history. Cleon argues for the Mytilene’s extinction. Diodotus, for their salvation. They disagreed on almost every point. What sticks out, however, is what they did agree on. Both wanted everyone to know that their arguments had nothing whatsoever to do with justice, honor, or mercy. I have often before now been convinced that a democracy is incapable of empire, and never more so than by your present change of mind in the matter of Mytilene. Fears or plots being unknown to you in your daily relations with each other, you feel just the same with regard to your allies, and never reflect that the mistakes into which you may be led by listening to their appeals, or by giving way to your own compassion, are full of danger to yourselves, and bring you no thanks for your weakness from your allies; entirely forgetting that your empire is a despotism and your subjects disaffected conspirators, whose obedience is insured not by your suicidal concessions, but by the superiority given you by your own strength and not their loyalty….. I therefore now as before persist against your reversing your first decision [to kill the Mytilenians], or giving way to the three failings most fatal to empire— pity, sentiment, and indulgence. Compassion is due to those who can reciprocate the feeling, not to those who will never pity us in return, but are our natural and necessary foes: the orators who charm us with sentiment may find other less important arenas for their talents, in the place of one where the city pays a heavy penalty for a momentary pleasure, themselves receiving fine acknowledgments for their fine phrases; while indulgence should be shown toward those who will be our friends in future, instead of toward men who will remain just what they were, and as much our enemies as before. To sum up shortly, I say that if you follow my advice you will do what is just toward the Mytilenians, and at the same time expedient; while by a different decision you will not oblige them so much as pass sentence upon yourselves. For if they were right in rebelling, you must be wrong in ruling. However, if, right or wrong, you determine to rule, you must carry out your principle and punish the Mytilenians as your interest requires; or else you must give up your empire and cultivate honesty without danger (3.37; 3.40). However, I have not come forward either to oppose or to accuse in the matter of Mytilene; indeed, the question before us as sensible men is not their guilt, but our interests. Though I prove them ever so guilty, I shall not, therefore, advise their death, unless it be expedient; nor though they should have claims to indulgence, shall I recommend it, unless it be clearly for the good of the country. I consider that we are deliberating for the future more than for the present; and where Cleon is so positive as to the useful deterrent effects that will follow from making rebellion a capital offense, I who consider the interests of the future quite as much as he, as positively maintain the contrary. And I require you not to reject my useful considerations for his specious ones: his speech may have the attraction of seeming the more just in your present temper against Mytilene; but we are not in a court of justice, but in a political assembly; and the question is not justice, but how to make the Mytilenians useful to Athens…. That language saved the Mytilenians. They were lucky. Interest is a fickle master. The men of Melos discovered just how twisted a master it can be. In time, so would the Athenians. “Consider also that at present the Hellenes generally regard you as a model of worth and honor; and if you pass an unjust sentence upon us in this which is no obscure cause— but one in which you, the judges, are as illustrious as we, the prisoners, are blameless— take care that displeasure be not felt at an unworthy decision in the matter of honorable men made by men yet more honorable than they, and at the consecration in the national temples of spoils taken from the Plataeans, the benefactors of Hellas…..
….Such, Spartans, are the facts. We have gone into them at some length both on your account and on our own, that you may feel that you will justly condemn the prisoners, and we, that we have given an additional sanction to our vengeance. We would also prevent you from being melted by hearing of their past virtues, if any such they had: these may be fairly appealed to by the victims of injustice, but only aggravate the guilt of criminals, since they offend against their better nature. Nor let them gain anything by crying and wailing, by calling upon your fathers’ tombs and their own desolate condition. Against this we point to the far more dreadful fate of our youth, butchered at their hands; the fathers of whom either fell at Coronea, bringing Boeotia over to you, or seated, forlorn old men by desolate hearths, who with far more reason implore your justice upon the prisoners. The pity which they appeal to is due rather to men who suffer unworthily; those who suffer justly, as they do, are on the contrary subjects for triumph. For their present desolate condition they have themselves to blame, since they willfully rejected the better alliance. Their lawless act was not provoked by any action of ours; hate, not justice, inspired their decision; and even now the satisfaction which they afford us is not adequate; they will suffer by a legal sentence not, as they pretend, as suppliants asking for quarter in battle, but as prisoners who have surrendered upon agreement to take their trial. Vindicate, therefore, the Hellenic law which they have broken, Spartans, and grant to us, the victims of its violation, the reward merited by our zeal. Nor let us be supplanted in your favor by their harangues, but offer an example to the Hellenes that the contests to which you invite them are of deeds, not words: good deeds can be shortly stated, but where wrong is done a wealth of language is needed to veil its deformity (3.67). The Plataeans lost their case. Thucydides, as he is wont to do, suggests that the decision to slaughter them all was made for cold geopolitical reasons. Perhaps it was. We cannot know for sure. The Melian dialogue may just have been, as A.E. Clark argues in his latest post, “Athen’s finest hour”—the moment when all falsehoods and posturing were laid aside, and the truth of the war was revealed for all to see. The Athenians were honest. Only the Athenians could be so honest. The Spartans did not talk about war in such terms. To the end they talked and thought and fought in a world they never stopped describing with words like justice and honor. Maybe they were deluding themselves. But note:. it was the men of Sparta, not the men of Athens, who won the war. ….The strong do what they can while the weak suffer what they must.